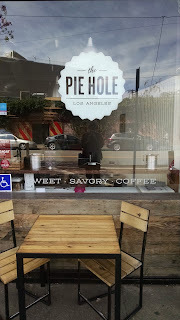 The Pie Hole is in the arts district east of Japantown. This neighborhood is changing by the minute. Apartments and parking buildings are being built all around but aging industrial structures still dot the landscape. Fashion photographers and can collectors share the sidewalk as they practice their respective trades. 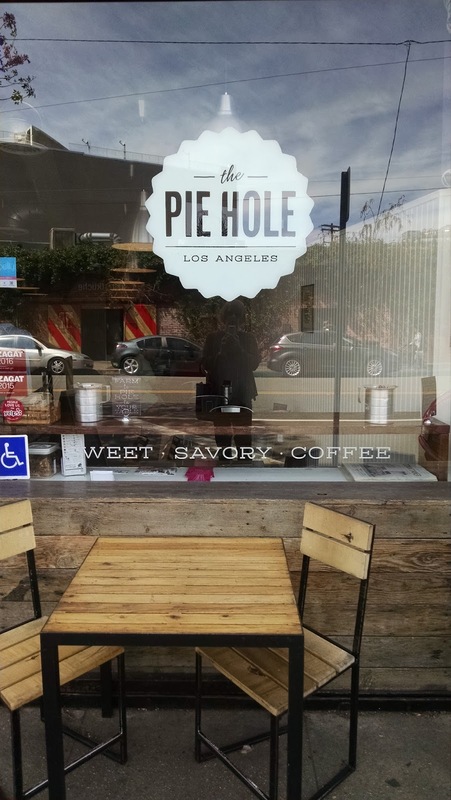 The Pie Hole is a modest storefront. I almost passed it by as I walked on the opposite side of the street. The interior is similarly low-key although nicely decorated with pie recipes. The staff was very happy to talk pie baking with me. I started with a savory pie, the curry vegetable. I could smell the curry even before I cut into the pie and did it smell good. Once I got into the pie, I found that the curry was just right, strong but not too strong. The vegetables were very soft and tender. The crust was perfect in color, texture, and taste. 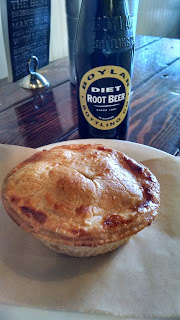 I finished my lunch with their signature pie, the Earl Grey. The top layer is a white chocolate that has been infused with tea. That's a great and natural combination. The tea taste is definitely present but not overbearing in any way---not a hint of tannin. 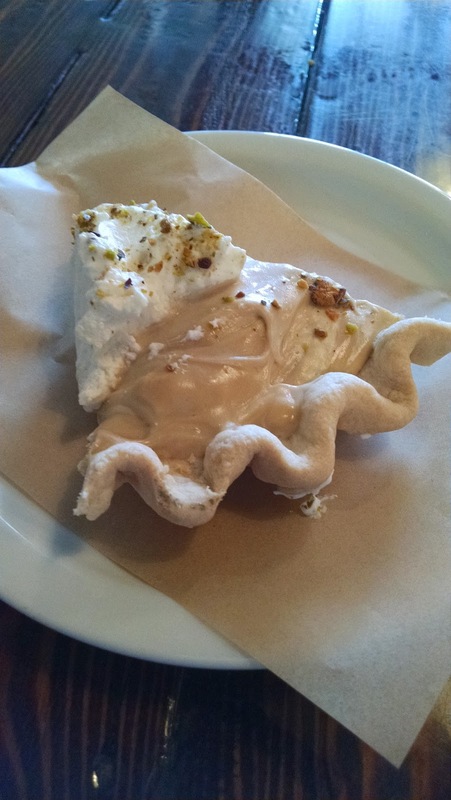 Most cream pies have a fairly firm texture but not this one. The top layer barely stood up on its own, giving a sense of excitement to eating it. Would it stand long enough for me to make my next bite? The bottom of the pie was covered with a thin layer of dark chocolate and a scattering of pistachios. This pie is truly magnificent. Cedar Creek Pub is located on the Anschutz Medical Campus of the University of Colorado. My CU Denver friends and I adjourned there for good food and discussion. I ordered the fish and chips. The fish was excellent: crispy, fluffy beer batter coating tender, moist cod. The fries were great, too. We took a drive on a beautiful day to Kalona and had a very enjoyable lunch at JW's Foods. Kalona is a small town about 20 miles south of I-80 year Iowa City. The area seems to be a mix of Amish and Mennonite. JW's foods is a grocery store with a restaurant inside; it is located at the edge of town near the grain silos. The service was very helpful and friendly. The food was pretty darn good. I couldn't resist the tenderloin sandwich and I wasn't disappointed. As is traditional for these sandwiches, the tenderloin hangs out well over the bun. The pork tender was tasty and tender with excellent breading. Debbie had a beautiful turkey sandwich handmade from the deli. She reports that everything, from the bread to the meat, was outstanding. Roswell Road near the Perimeter hosts a big string of middle Eastern restaurants. I've sampled a few (that I didn't yet review, in case you're wondering) and I am slowly working my way down the road. The other night it was Fanoos's turn. I enjoy middle Eastern food because it offers interesting flavors in lighter forms. My appetizer was a tomato concoction served with a flat bread very reminiscent of an Indian naan. It was accompanied by cheese, walnuts, and olives. None of the food at Fanoos is heavily spiced. My entree was a chicken skewer and rice with cherries (!). I ate the chicken and rice separately. I probably should have deskewered it, cut it up, and mixed it with the rice.